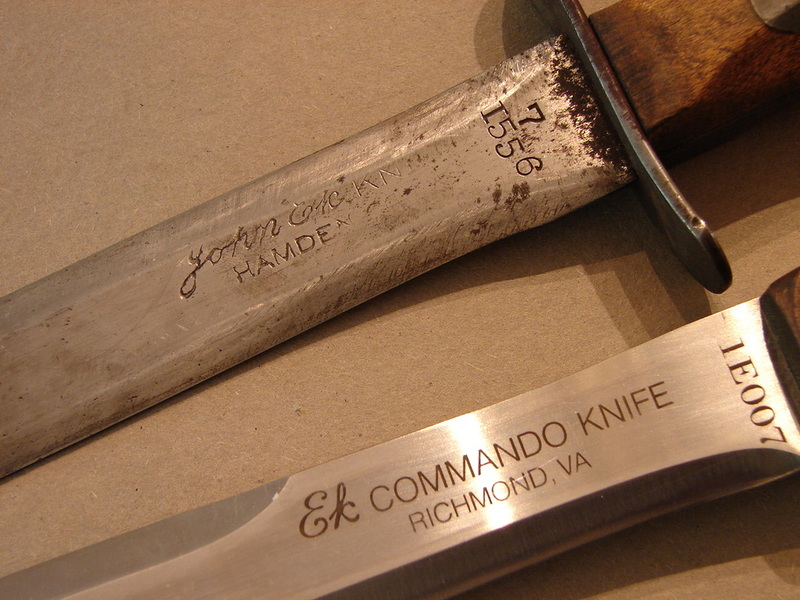 Ek Throwing Knife: This is an Ek knives throwing knife from Their time in Richmond, VA. It is a reproduction of those made during WW-II and later. It is made from one piece of steel and is indestructible. 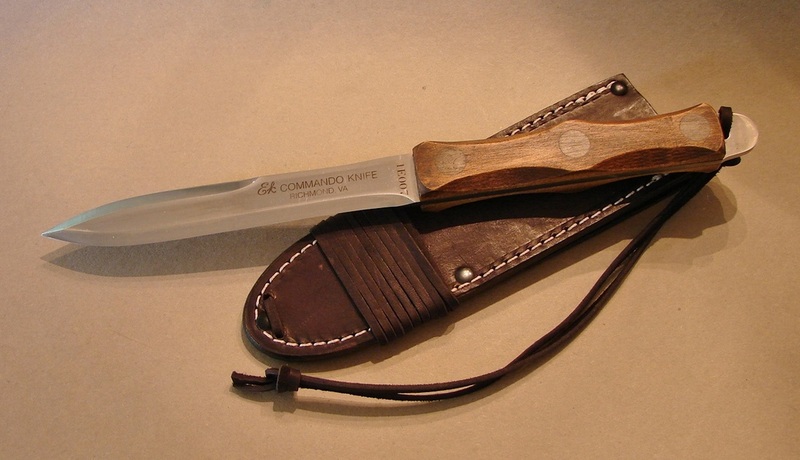 it comes with its original leather sheath. 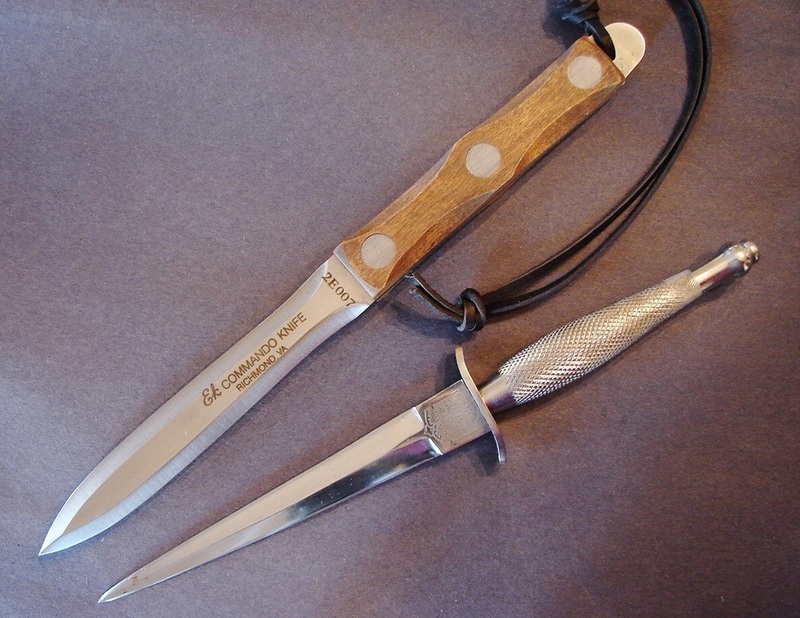 The knife could be used for stabbing but there is not much edge length for cutting, but then the thumb daggers and lapel daggers do not have much edge either. 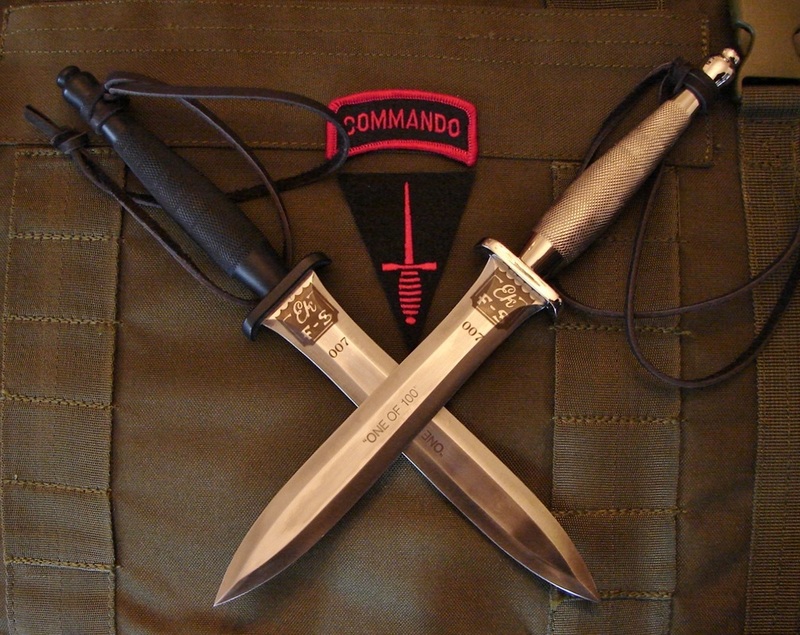 I do not know if there are any known incidents of this type of knife being used in combat. I am not a proponent of throwing away your weapon in combat! Below: This Ek knife is based on their tribute to the "F-S" with the full tang construction and hard maple handle scales. Note the shape of the skull crusher which is formed like the pommel of a F-S knife. Replicating WW-II construction techniques, the scales are affixed by poured lead rivets. 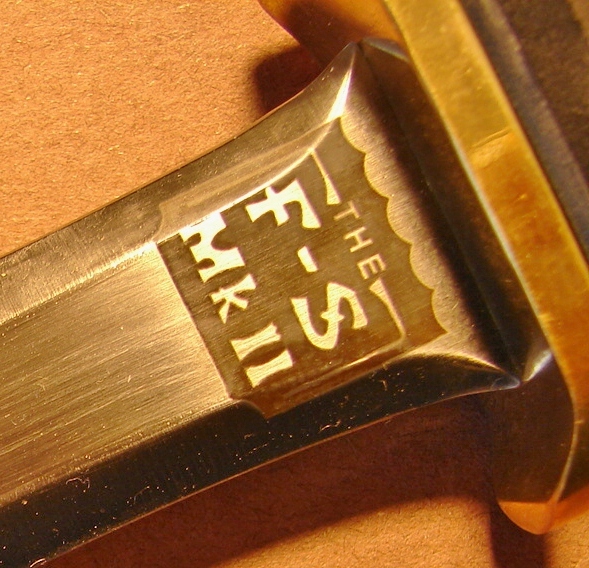 It is proudly etched with the name, the "F-S MKII" logo and my serial number 007. While some will complain about the use of the F-S etch on an Ek Knife, I would say that: "Imitation is the sincerest form of flattery." 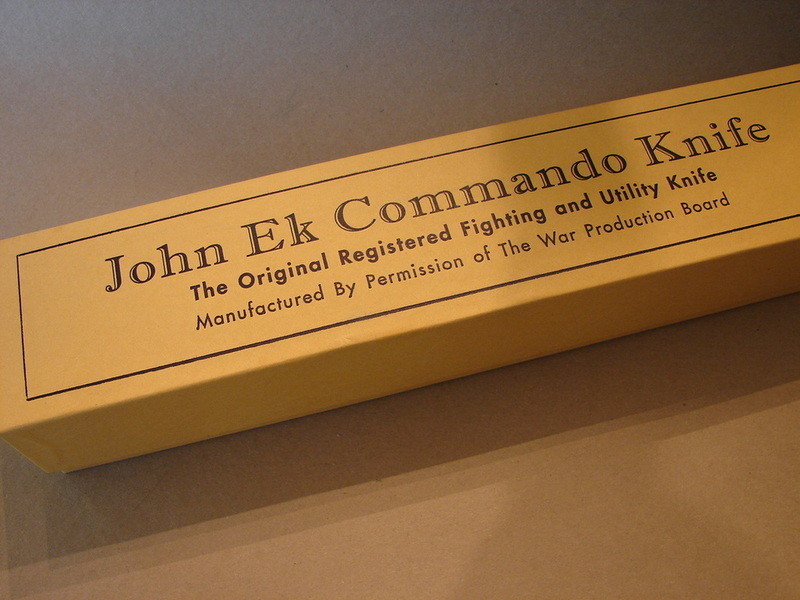 The John Ek Co. built probably tens of thousands, of excellent fighting knives. His WW-II production facility was originally established in Hamden, Connecticut (1941-1949). Later, (1949-1982) the company moved production to Miami, Florida. 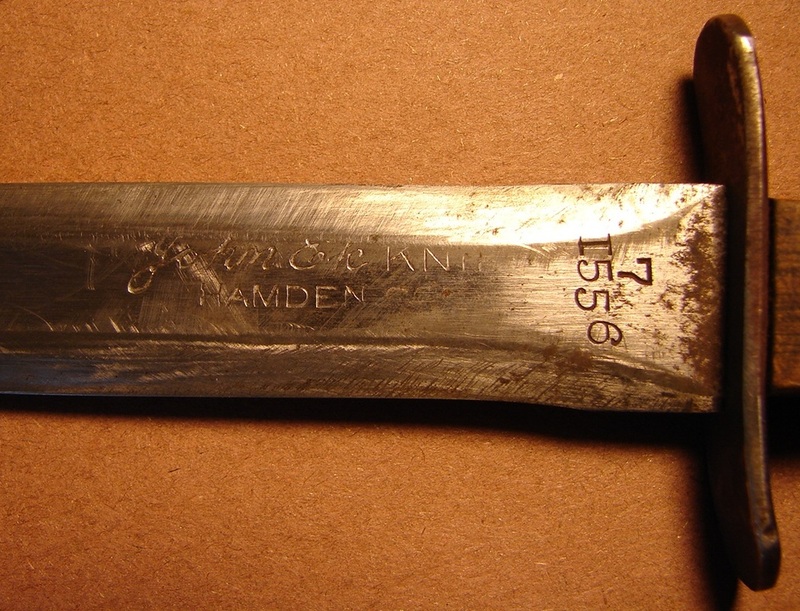 Ek produced many different patterns of knives but his Model No. 2 (without a guard) and his Model No.7 (with guard) most closely resembles the F~S. 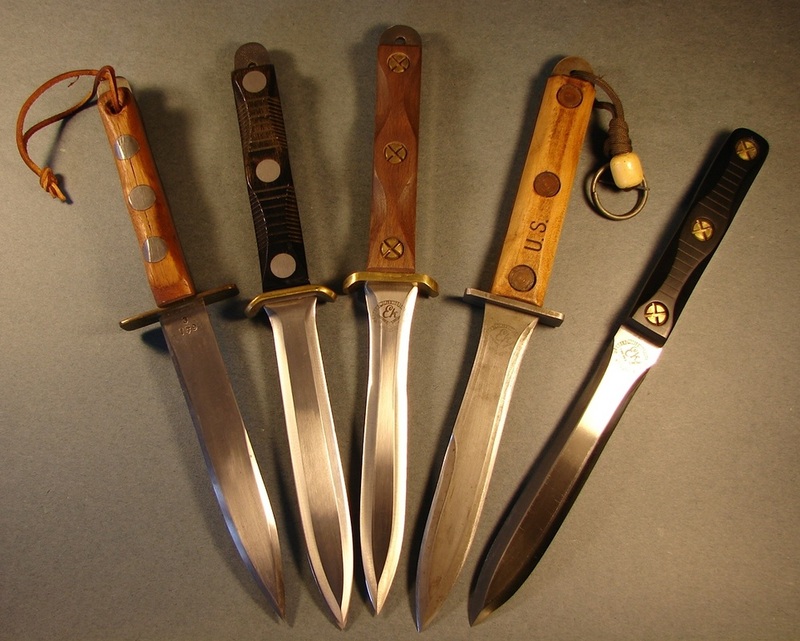 During the war Ek restricted sales of his knives to men and women actually serving in a theater of war. He employed many disabled people giving them an opportunity to be a meaningful part of the war effort. 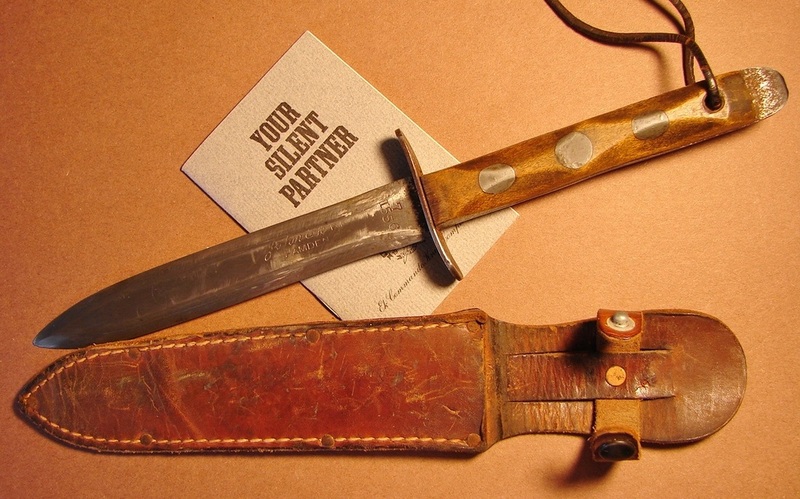 Each of his knives were serial numbered and issued with a certificate of ownership. The wooden handles were made from hard rock maple and held in place with three cast-in lead rivets. Should the handles loosen, due to shrinkage or abuse, the owner simply had to hammer the lead rivets to snug the wooden handle slabs. Some of his models could be bought with or without a cross guard. 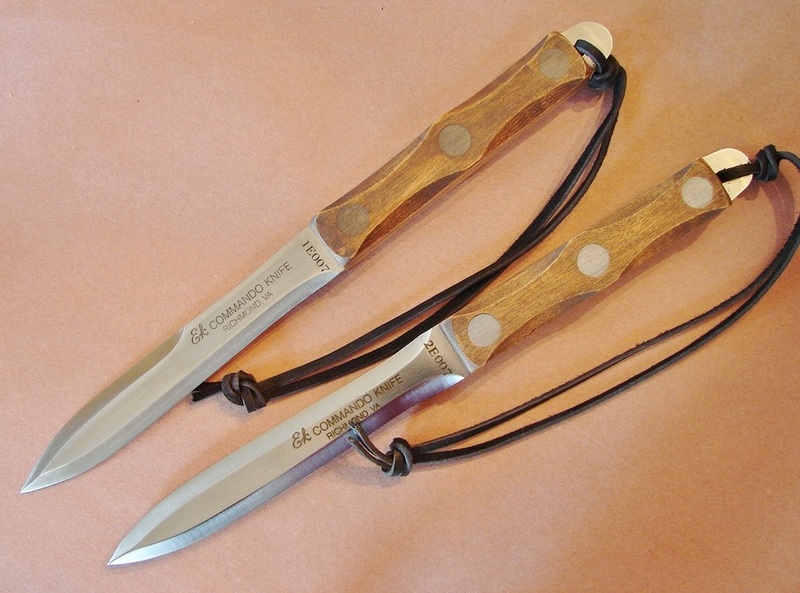 The unique faceted handle shape prevented the owners hand from sliding onto the blade, even on the guard-less knives. 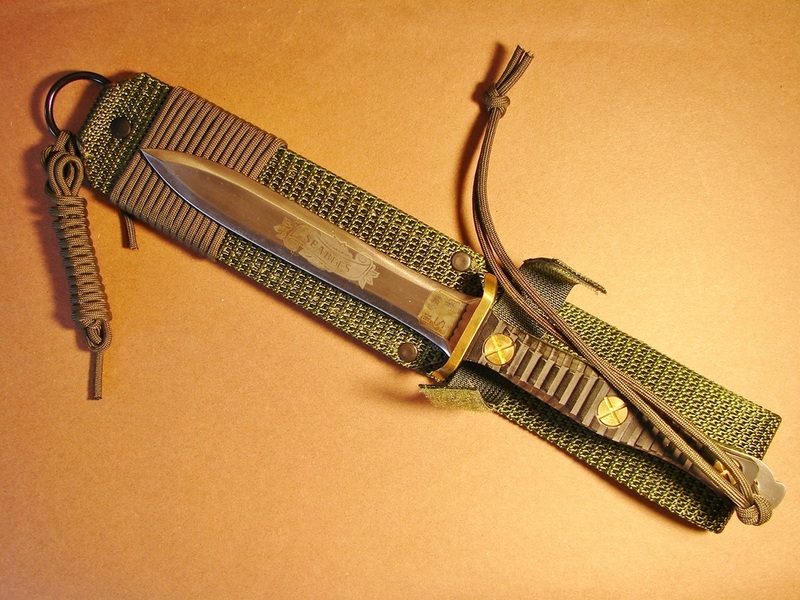 Shown below is a Vietnam era Ek knife Model 3, with the typical lead rivets, flat brass guard, in what I believe is a KaBar MK-II sheath. These are very utilitarian knives with no flash to them. Still, a man with an Ek had a knife he could depend upon. They are full-tang construction and even if the handles fell completely off a little cord or leather wrap would put you right back in business. The next knife is more current, being a veteran of Desert Storm. The owner reshaped the handle to fit his needs and added another unique touch, a grenade pin on the handle lanyard. As the saying goes: "When the pin is pulled Mr. Grenade is not your friend." If you have pulled the pin but not released the handle you may make it safe again by re-inserting the pin. That is assuming you did not lose the pin in the sand somewhere. It is always nice to have an extra grenade pin, because when you need it, you REALLY need it! This is Ek's "Warrior" model with an edge and a half. A no-nonsense rectangular steel guard is fitted and the knife is housed in the modern Web Belting style sheath. 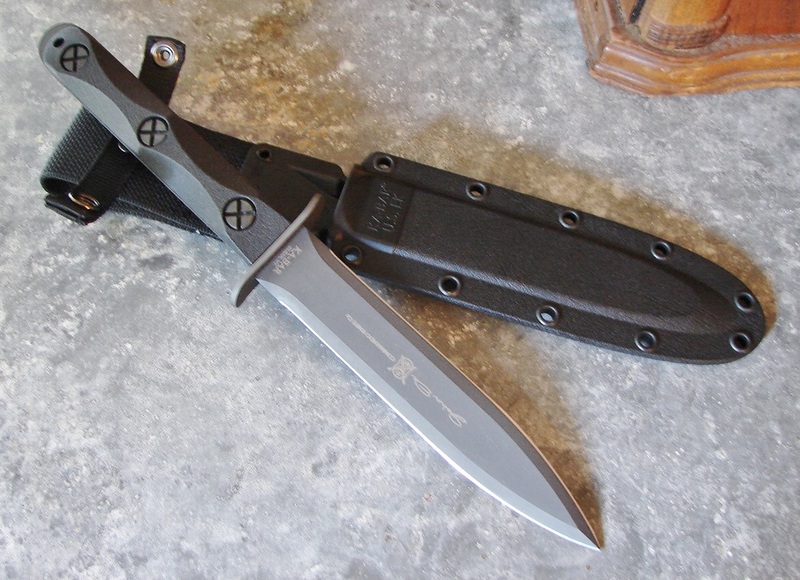 Below: My newest Ek Knife is a faithful reproduction of the WW-II Model-2 double edged dagger. It has a matching 007 serial number as my Model 1 Ek. I have photo'd it overlaid on the note from Mr. Robt. Buerlein, president of Ek Knives, thanking us for posting their fine knives on our website. The honor is all ours. The model 2 is my all-time favorite Ek Fighting Knife, the definition of elegance, simplicity, and function. Illustrated below is one of their recent tributes to the F~S genre'. 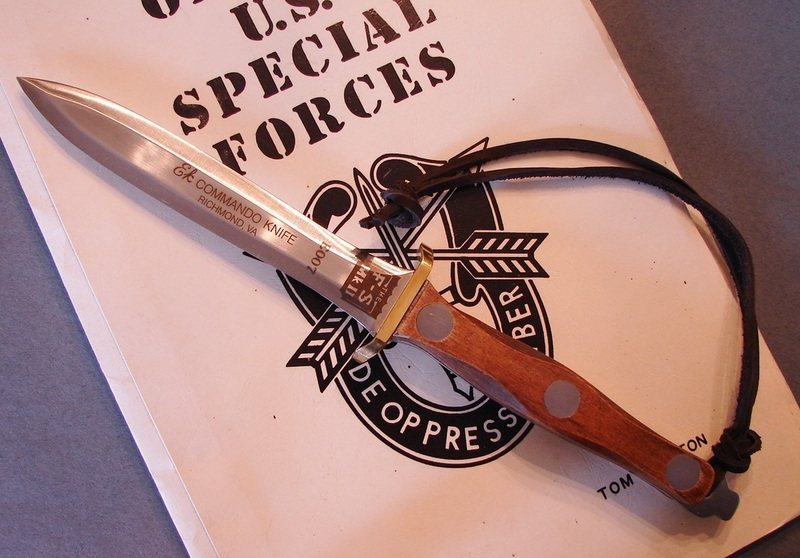 When I called to order my knife I asked if it would be possible to have the blade etched "SeaBees," since that was my branch of service. Robert Buerlein quickly had the etch transfer made up and granted my request. That type of customer service is seldom found in today's market place. This is a superb fighting knife! 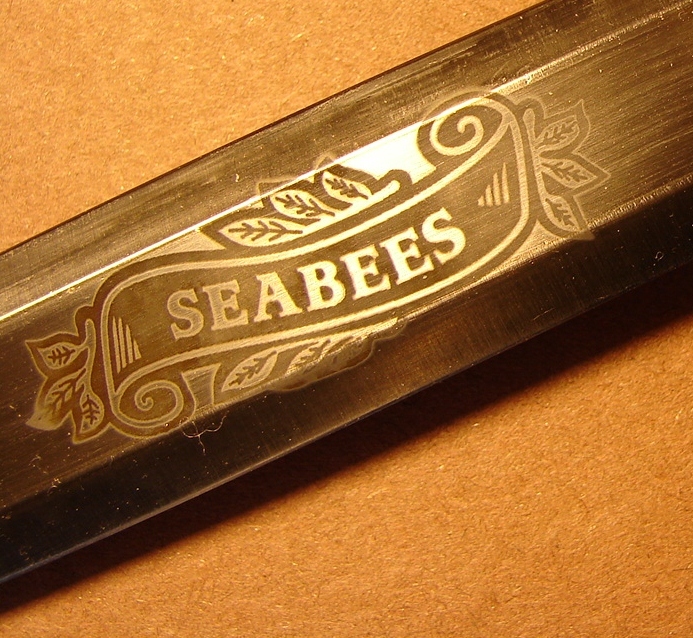 This is the very first Ek MK-II to be etched with the SeaBees logo. The shoulder of the graceful blade is etched "F~S" to give tribute to the Fairbairn~Sykes design. From left, to right: Vietnam Era Ek model 3, Ek P-4 double edged with guard, Pakawood handles and lead rivets, Ek G-4 walnut "Gunner" grips, Ek Desert Storm "Warrior" model with grenade pin on the lanyard, Ek M-2 double edged without guard. GREAT NEWS: from the great people at Ek Knives. I spent some time on the telephone with Mr. Buerlein talking knives in general and he advised me of an upcoming replica of the first ever Ek Knife. This new Model One was going to closely duplicate the original model 1 which was so popular with fighting men in WW-II. He put me down on the list to receive a knife and it arrived a few months later. It is illustrated here. One of the first things to greet my eyes was a very nicely made walnut, glass-topped display case. The knife box itself came wrapped in a waxed paper. Upon opening it I was further amazed to see that the box was a reproduction of the original boxes that Ek Knives were shipped in. The attention to detail and quality has always been one of Bob's hallmarks. The box seemed to set the stage for the knife which was further protected by a white linen bag. Finally I pulled out the knife and was tremendously impressed with the finish on the blade, crisp etching, razor sharp edges, traditionally shaped and colored maple handle scales properly held in place with lead rivets. 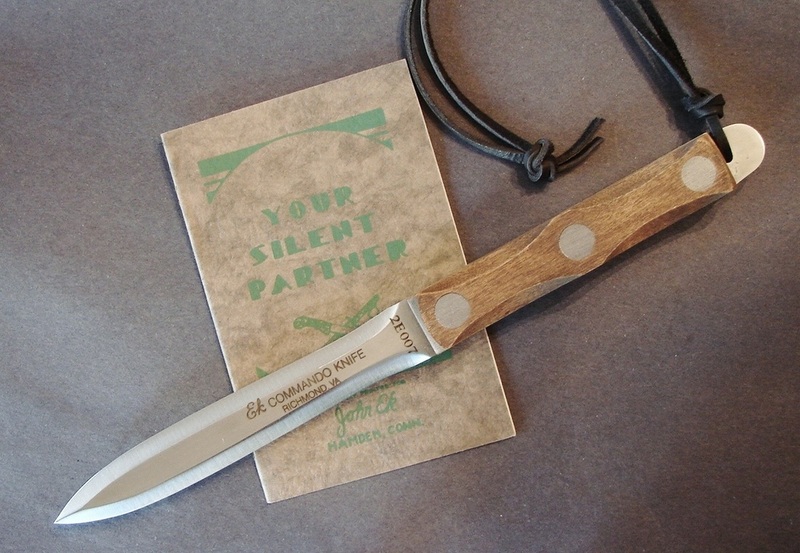 It is a superb collectors piece and fully functional fighting knife. I almost forgot to tell you about the reproduction sheath, made in the original style of heavy leather with a nice long tie down thong and reinforced with rivets. Kudos to the entire team at Ek Knives and Bob Buerlein for a quality job. Thanks Bob for the 007 serial number! 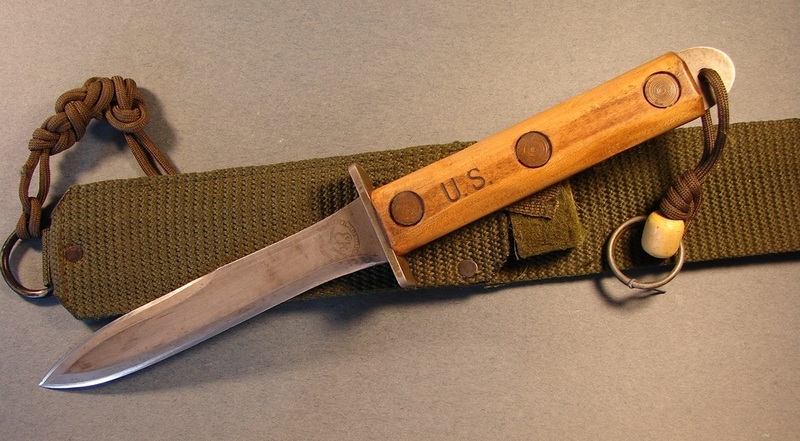 Below: Photos of my second WW-II repro knife issued by Ek Knife, a Model 2. Here is the latest knife to come out of the Richmond, VA Ek shops. I have posed it with an original WW-II booklet "Your Silent Partner," graciously given to me by Mr. Buerlein. 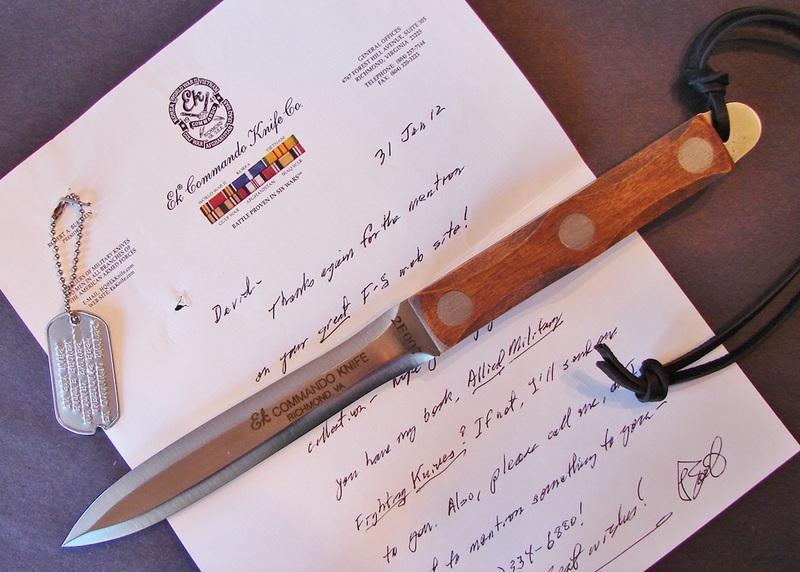 The instruction booklet was included with every knife shipped to a member of the Armed Forces. This photo contrasts the austere ruggedness and simplicity of the Ek with the elegant but delicate looking Fairbairn-Sykes first pattern knife. The Ek would be a superior cutting weapon, where the Fairbairn might have a slight advantage in a thrust. Below: My set of serial numbered Ek knives, a Model 1, and a Model 2. The both exhibit the 007 serial number. They are just like a page out of a 1940s man's magazine ready for combat and honed to a razors edge. There are not your usual buffed 440C stainless wall hangers that some companies make. Made from high carbon stainless they are full fledged fighting knives, descended from a proud lineage, ready to go in harm's way.